Andrew Kennedy's Angling Blog at Just-Fish.co.uk - Fishing Blog Coarse Fly Lure Pike Perch: River Pike - Not Much Beats 'Em! It's been a while since I posted but the good news is that I did manage to notch up a session in February and I've already got one under my belt for March but the river closed season (which I back 100%) is looming ominously. I am now faced with the dilemna of which river/stretch/swim/species to target for my final session of the 2010/11 season. Not an easy one when I've got memberships of 5 clubs, all with their own merits, but I prefer to have plenty of options available (usually, but not when it's down to choosing one last session!). Anyway, that's to come later this week, but for now I'll tell you about my last two sessions, during which I have been reminded just why and how much I love catching pike from a natural river. The week or so preceeding the first session had started off with a lot of rain falling and relatively mild weather, but as my session grew nearer, the rain subsided, river levels dropped and clarity started to return to the water. 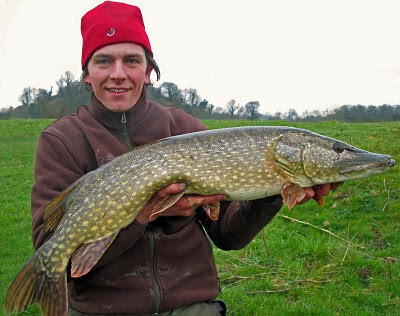 These developments had me changing my mind at the last minute; I'd originally decided to fish for barbel, but with the water dropping I had an urge to get out there pike fishing. In the end, I went piking but had barbel tackle with me too, in case the river clarity wasn't as I was expecting. To cut a long story short, I fished 4 or 5 feature swims over a few hours without a touch and decided to move to a different stretch of river, which could offer me the chance to fish for barbel later should I wish to. Rain had fallen again overnight and by mid-day the river was rising fast and the colour was returning to the water. Just when I thought my chances of a pike were completely gone, I had a frantic 15 minute period which gave me two runs from the same spot - both on smelt - resulting in one fish landed and one dropped run. I was casting to a tiny slack behind a far-bank bush and thought I'd hooked a monster. It surged into the fast mid-stream flow and ran downstream so far that I had to acrobatically pass my rod around some overhanging trees to follow it! This is when I realised just how much the river had come up; for maybe 30 seconds I though the fish was snagged because we were completely at deadlock, but finally it surfaced and I was amazed but ever-so-slightly disappointed to see a pike of around 6lb surface! I was out of breath, my arms were shaking and my heart was pumping hard... all from a pike of this size?! It was only after I quickly unhooked and returned this fish that it hit me just how enjoyable the whole experience had been and that such a fish from a drain, canal or lake could not have possibly given such an account of itself. It was a combination of the rivers ferocity and the pikes instincts to use this power to its own advantage which had given me this immense battle from less-than immense fish. I was suddenly glad I'd chosen to come pike fishing on a river, despite the conditions. As an added bonus, one of my new Shimano Purist Deadbait Classic rods was christened by this pike! After missing the next run which came almost immediately after re-casting, I gave the swim another half-hour before cutting my losses and grabbing my barbel gear. I spotted a peg which looked perfect, but I had another peg in mind which was quite a long trudge away, and I chose not to be lazy and walked to it. I'd had some barbel from it in the Summer and I was sure it would have the ideal mixture of deep, slack water and fast water which would be the key to me finding some huge winter barbel. When I got there I was disappointed to see that this swim was not behaving how I expected it to with the extra water, but I had walked a long way with far too much tackle, so I set up there anyway. Four hours passed with the only things caught being hundreds of dead leaves gathering on the line (in February?! Where've they come from?!). I packed away dejected, but having not much experience of barbel fishing after early November, I suppose it was a small lesson learned. On my way back to the van, I noticed a fishing umbrella reflect my torch light on the other peg I was going to fish. The chap fishing there informed me this was a pretty good swim in these conditions (why oh why didn't I trust my instincts!!!) and he'd had a couple of chub on breadflake (which was more than I'd had), but he was now fishing boilies for barbel. As I stood chatting to him, his upstream rod lurched over, and upon picking the rod up the guy pronounced "This is a Barbel...". Before long it broke the surface and a beautiful, chunky specimen rolled into his small pan net. It weighed 12lb 3oz! That would've done me very nicely! There wasn't a mark on this fish, it was one of the most scale-perfect big barbel I've ever seen. I did offer to take a photo but the angler was intent on getting the fish back quickly, which I can't blame him for (although the unhooking and weighing was very routine, so the fish was hardly out of the water), but I know with a fish of that stamp and condition I would have been keen to get a trophy shot. Fast forward to last Friday, the 4th of March. Knowing that the clock was ticking before the end of the season, I really fancied giving the centrepin another run out, trotting for grayling and chub. As a new challenge I decided to visit the Dove, rather than the Derwent, as I had never really fished the Dove in winter. 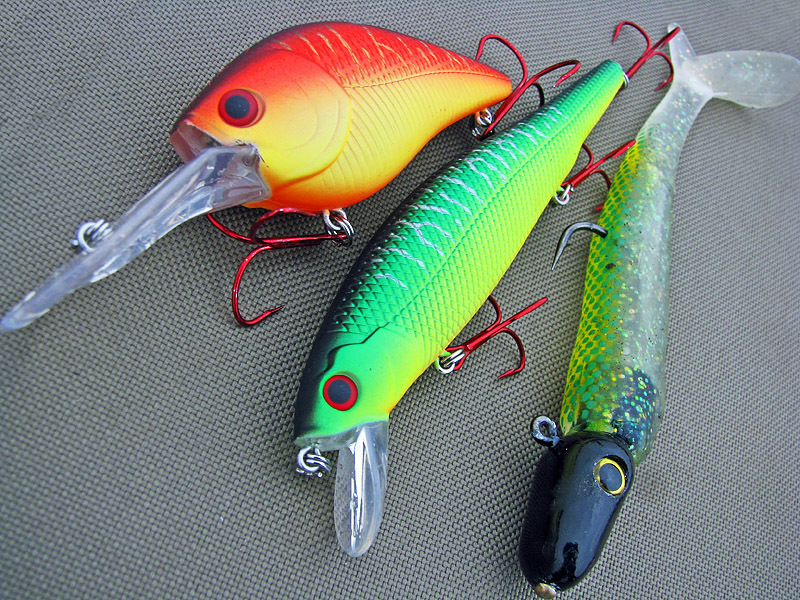 A small part of me was nagging to take a pike rod to fish as a "sleeper" while I trotted, so I packed a handful of deadbaits and my pike tackle and initially set-up in a deep-ish swim which shallowed off at the downstream end, above some rapids. The pike rod was cast into the near margin as I tried to build up a swim, feeding a small sprinkle of maggots every couple of minutes. After a couple of hours of trying different trotting speeds, depths, casting distances and baits, I'd had nothing to even suggest a bite, but I'd re-cast the pike bait into a small slack behind a tree. Within a couple of minutes of the re-cast, my Billy's Backbiter alarm (which I was testing out for only the second time) hollered at me that the lead on my float-leger setup had been dislodged and I hurried to check that indeed the float was moving (still getting used to using a back-alarm rather than a front, roller-wheel one). The bite was positive so I wound down straight away and watched the Purist take on a lovely curve. 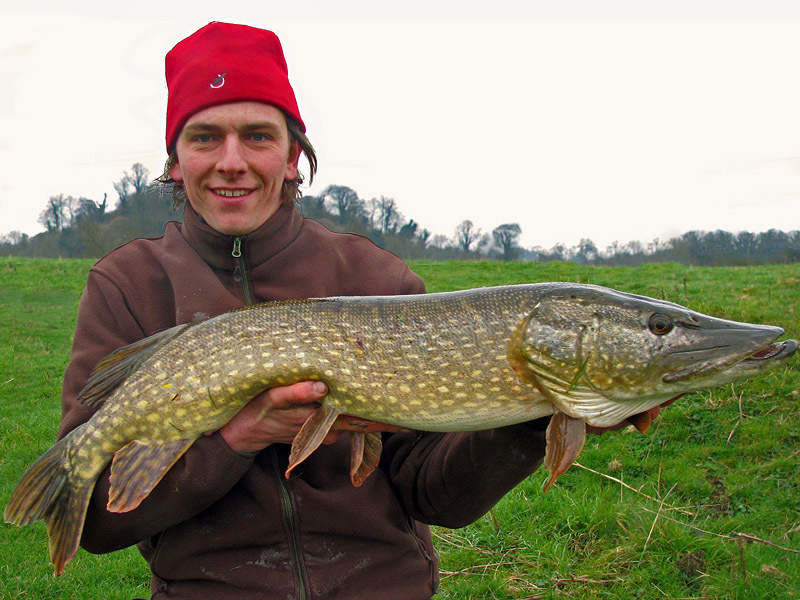 If I hadn't been reminded quite enough on the last session why I loved river pike, I needed no reminding now! This fish pulled hard to reach the tree, then as I turned its head it made for the main flow and accelerated! What a fight I had on my hands and as I finally drew the fish toward the landing net, in true pike fashion, it opened its mouth and violently shook its head to try to shed the hooks. Luckily, although only lightly hooked with one point of one treble, the hooks held firm (good old Owners!) and my prize rested safely in the mesh of my landing net. Immediately I knew this was my largest pike from the Dove and the weighing ceremony confirmed this, with the fish registering 18lb 13oz, making her my second biggest from any venue this season. As a small side-note to this, I've caught pike of every single weight (i.e. between 10lb & 11lb and between 16lb and 17lb) up to and including 21lb, but I've never had a fish wiegh between 19lb and 20lb. I've had two fish just ounces short this season and it does make me wonder if I'd get more satisfaction from "completing the set" with a 19lb fish than I would from catching a 20lb+ fish! 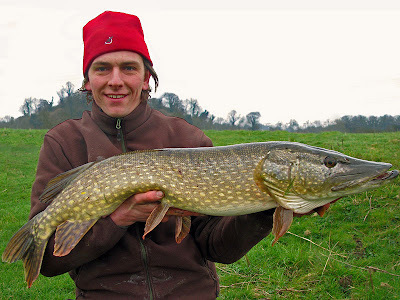 So, if anyone knows of a water with a good head of 19lb 5oz pike in it, let me know! I lost another fish later on, which felt big, but if I don't end up piking this week, I'll be happy with how my piking has gone this winter. Not as many sessions as I'd like, but when I have gone, I've done well. A not-so-grand tally of 5 individual pike landed from 5 sessions, but with 3 of the fish weighing over 17lb, I'm viewing it as a very successful campaign. Maybe next winter I'll catch 100 tiny jacks! i been lure fishing for last 6 months not one pike, until last week i bagged my first one 31 lb n half, best if i could put pic on. New British Perch Record - 6lb 2oz!! !